I haven't seen Avengers yet. 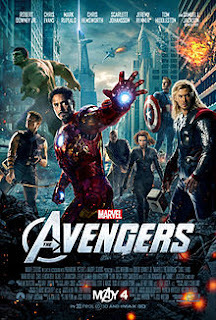 I had one of the fun surprises in the movie ruined for me--which was lame--so I've put myself on an, "Avengers blackout," where I won't look at any new reviews or information about the movie to avoid spoiling anything else before I see it tonight at midnight with my incredibly patient-with-me girlfriend. Before I see it though, I admit that while I am excited and have been waiting for this since that scene after the credits of Iron Man where we hear, "Let me tell you about the Avengers Initiative," I have this nagging feeling. I feel a little like a traitor to the very men who helped create these amazing characters, you see. What's that? What am I talking about? Well, Stan Lee is happy to mug for Marvel and take the credit for making the Avengers and all those other characters, but so much of it was a multi-person effort with people like Jack Kirby, Joe Simon, and more making these characters and the initial tales that made them so popular. Creators who made some of our favorite heroes (Avengers and all the others) were not repaid with royalties but instead are often dying fighting Marvel for their art back (Kirby),or having to beg the comic community for help for their health problems (Quite a few). There is some help however, in a not-for-profit that was founded known as the Hero Initiative that helps comic creators because publishers don't have the heart to do so. Even the Initiative can only do so much, as creators like Gene Colan who received help from them still had to sell art to merely pay hospital bills until his passing. The family of the creators of Superman are fighting DC for some money for the most-recognized character of all-time. Jack Kirby's name wasn't even in the credits for the Avenger's movie and Stan Lee sounded like he didn't give a damn, until Marvel at the last minute put Kirby's name in--probably to avoid too much bad press. All these creators screwed over, and Stan Lee has enough power he could shame Marvel into doing something but they pay him enough money he keeps his mouth shut and he keeps smiling for the camera. I have a complex relationship with Lee. I love him for the things he helped create and write, and will be so sad when he dies, but I also feel a bit bitter about how he doesn't seem to care at all about his fellow creators. He's like a relative who lavishes you with love but ignores all your other cousins. You feel great, but feel bad for them. How can I truly enjoy Avenger's knowing that creators are still having all this done to them, and fans are cheering about corporations screwing over the men who made these tales because they don't want to risk losing getting their monthly hero-stories if a company decides it would rather not publish Superman or Iron-Man instead of paying royalties? God, look at, "Before Watchmen," and how little respect DC must have for Alan Moore now considering he has said countless times over the years, "DC, please quit screwing with me," and they haven't in the variety of ways I have read about them doing crass things to Moore. Really, how can I? I'm not sure, but there are some opinions out there. Some people suggest just not seeing Avengers, but I'm not sure that's the way to go. I like the idea of donating money to causes that support creators in equal to your ticket price to see Avengers. That sounds like a really fair thing to do. It show creators we value them, and lets us enjoy something some people have been wanting since that first issue of The Avengers came out all those years ago. Go to this link to give, and give what you want. Yes, it is tax-deductible as they are a non-profit. It makes me feel like I'm both supporting the people who made the characters I love, and the ability of a company to make more movies about those characters (although its not as if Avengers will be hurting for money). There, I've said my peace. I don't know that I buy this mentality. Giving to the Hero Initiative is a great and noble thing to do, but people who go along with this idea will still be financially rewarding one of the companies that brought about these problems in the first place. It just seems like a way for people to have their cake and eat it too -- to claim that they "support creator's rights" even as they continue to shell out money to the corporations that continue, to this day, to try to take those rights away. An extremely valid point. It reminds me of an editorial that essentially went, "Hey Marvel and DC, it would be great if we could enjoy your comics without feeling like jerks." I have mixed feelings about my actually going and seeing the movie, wondering if I am somewhat having my cake and eating it too, as you put it. I'm not sure there is a best answer to this besides the obvious one of Marvel and DC doing right by creators, but I mean a right answer as in if people should feel it is okay to see the Avengers movie, new Dark Knight movie, etc. I guess it comes down to personal choice, and I will be seeing it, with the mixed feelings that entails.